Morwhenna. The Creative Adventurer: What does The Land of Self Belief look like? This month I'm going to explore Belief in Self. Also this fits under my words for 2014 - Exuberant and Abundant. As I shared in a previous post one of the things Exuberant means to me is confidence. And confidence in self and having that self belief. So I'm donning my *explorer* hat and setting off on a new Creative Adventure into this land....What will I find? What treasures will be unearthed? What does the land of Self-Belief look like? Thank you pinterest for this image! 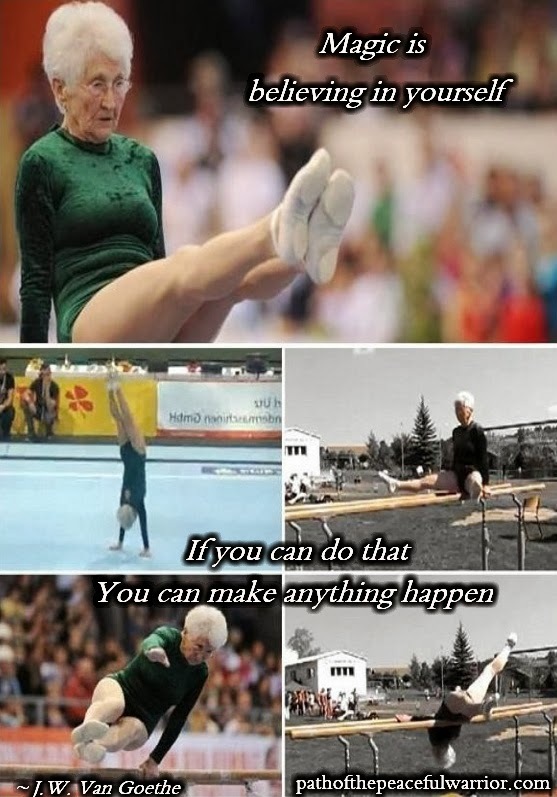 This is Johanna Quaas, A German gymnast who proves age is no barrier to sporting achievement by being named the world's Oldest Gymnast at the age of 86 in 2012. There is a lovely interview with her and footage of her in action. F**KING AMAZING!